As you all know, we take the health of our bulldogs very seriously. There is nothing more beautiful than the sight of a well-bred bulldog that is healthy and functional. This ideal is the motor that drives us and is at the heart of who we are at Bruiser Bulldogs. Obviously, the ideal bulldog is very important to us. It is however becoming increasingly more obvious to me that we need to explain how we go about reaching these ideals as much as it is important to explain the ideal itself. As we all know, how you get to a destination is often as important as the end itself. In light of this truth, let’s talk about vertical pedigrees. One would think that creating a healthy, functional bulldog would be simple enough. Simply breed functional parents free of any health issues and voila, logically speaking, we should have healthy offspring. Unfortunately, genetics and hereditary issues are not as black and white or as simple as this. 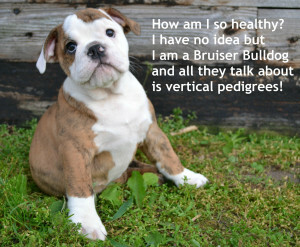 While we do test all of our adult bulldogs for health issues such as the eyes, patellas, heart, trachea, and elongated soft palate, there are more contributing health factors than simply the health of the parents. 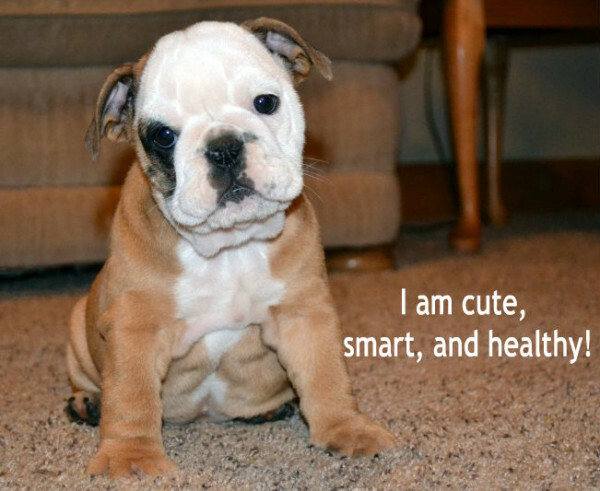 This is because recessive genes (hidden), variable expressivity of a said gene, and even environmental factors all play a role in determining whether a bulldog puppy will carry an unhealthy, genetic trait. For this reason, we also rely on a vertical pedigree database to improve our decision making and understanding the health of our bloodlines. 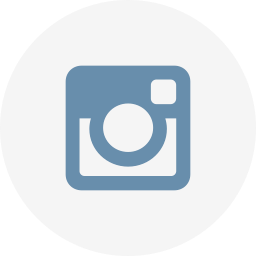 The vertical pedigree differs greatly from the traditional pedigree that we are all accustomed to. Traditional pedigrees expand horizontally. This means they are read from left to right with relatively few dogs appearing at the far left of the pedigree and increasing in the number of ancestors listed to the right. We know that the health of the dogs to the left (the mother, father, and grandparents) most directly impact the resulting offspring. The problem lies in the fact that there are only six participants in this sample size. A small sample size is problematic when trying to develop a statistical health pattern of possible offspring. In short, the health of six dogs is simply not enough evidence to prove the viability of healthy bloodlines. Furthering the problem, if one tries to add the health history of additional dogs from the right of the pedigree, we know these more distantly related dogs are less significant genetically than are those on the left. These distant relatives are somewhat unreliable in predicting the health of the offspring. While adding distant relatives might increase the sample size, unreliable data is not going to make the offspring any healthier! The solution to this problem is the vertical pedigree. 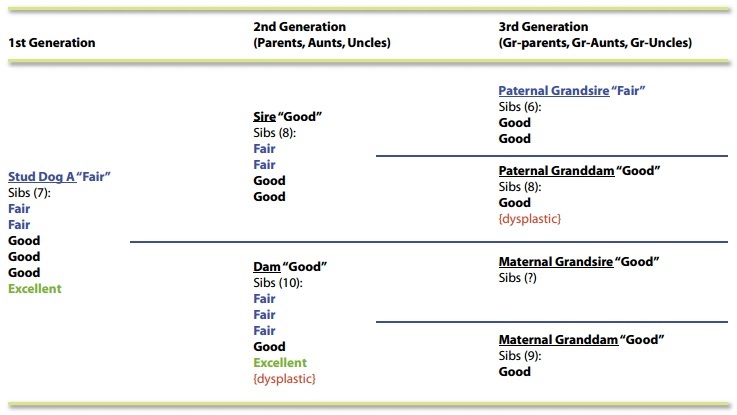 The value of the vertical pedigree begins with this simple truth: full siblings are equally genetically similar to each other as they are to their parents. This means you can generate as much or more health data in a bloodline from each sibling in the litter as you can from health testing the parents. It also means that you can generate more health data by factoring in the health of the siblings than just looking at the health history of grandparents or great grandparents. Often times health issues that are not recognizable through a horizontal pedigree become blatantly obvious when looking at the data of a vertical pedigree. Below is a great example of a vertical pedigree charting hip dysplasia in Labrador Retrievers. Notice there is information on the health of the siblings, the parent’s siblings and even in some cases the siblings of the great grandparents. This is great information! How does the vertical pedigree affect how we go about our day to day decision making at Bruiser Bulldogs? For starters, we are incredibly interested in the health of our offspring. Many of our adopters have noticed that we often ask for updates on their puppies. We do this for two reasons. First we absolutely care about our adopters and talk constantly about past puppies and their well-being. (Seriously, my wife and I occasionally have to self-impose a bulldog gag order for an hour or two because it is all we talk about. Being passionate about something is incredible!) Second, we record the health of the dog in our vertical pedigree database. By doing this we are informed on any breeding decision we make from then on. By doing this we add to our current information. 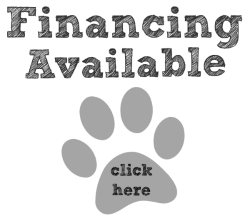 We have information on the health of the parent bulldogs (and their siblings), the health of grandparents and great grandparents (and their siblings) as well as the health of the litter mates. 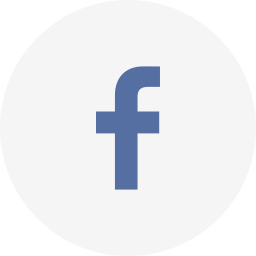 We can then go back to this health data when considering which bulldog to hold back as a future parent and more accurately predict as healthy set of offspring. By using the vertical pedigree in our breeding decisions, we are much more accurately able to reach our goal of breeding a functional bulldog that does not suffer from health issues that can plague the breed! If you enjoyed this article please do a couple things for me. Please, please, please comment and let me know if this article made you smarter and if it was new information to you.